Established in 1979 as one of the first Independent Honda Repair shops in the area, Diablo Auto Specialist quickly gained a following. People spread the word that our outstanding customer service and technicians repaired and serviced cars better than the dealerships. Over the years, we added educated technicians to our Honda specialist team, and now Diablo Auto Specialists are qualified to service all Japanese makes and models. In September 2002, Tim and Cathy bought the business. 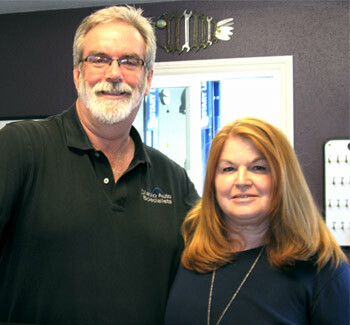 By taking over the shop, they fulfilled their lifelong dream of serving the community with a superior automotive shop. Through hard work and careful planning, Diablo Auto Specialists has grown. We now service most Import and Domestic vehicles. We dedicate our time to hiring the most qualified and talented staff, and invest in new technology and constant training and education. We are always looking for new ways to improve the business. Diablo Auto Specialists is proud to have an ASE Certified staff. We are also members of ASCCA (Automotive Service Council of California) & ASA (Automotive Service Association) We have been a Certified GREEN Business in Contra Costa County since 2005 & the Walnut Creek Chamber of Commerce named us 2010 Business of the Year. We appreciate all of our customers and advocates who have made us the success we are today. Ryan is the newest member of the Diablo Auto Specialists family. Ryan joined the Technical Team in August 2010. Ryan has over five Years experience and is an ASE Certified Master Technician, and also holds Advanced Engine Management & Smog Certifications. Ryan loves to conquer the most difficult diagnostic & troubleshooting problems. Ryan & his wife Sara just became first time parents of a beautiful baby girl in October. Congratulations to both of you! Don joined the Diablo Auto Specialists family in June 2004. Don has over twenty-five years experience as a professional auto mechanic and is ASE Certified. Don vast knowledge and experience working on most Import & Domestic vehicles makes him the anchor of our Technical Team. When not working on your cars, Don is most likely to be found either fishing from one of his ocean kayaks, riding his motorcycle, or off to the dog park with "Penny", his prized American Bull Terrier.